The Penrose Inquiry, the public inquiry into the circumstances in which patients treated by the NHS in Scotland became infected with Hepatitis C, HIV, or both, through the use of blood or blood products published its Final Report on Wednesday, 25 March 2015. The Inquiry was set up by Scottish Ministers under the Inquiries Act 2005 and was announced by the then Cabinet Secretary for Health and Wellbeing, Nicola Sturgeon, in the Scottish Parliament on 23 April 2008. However the largely avoidable acts of “biological terrorism” happened at a time when Scotland came under a Westminster Government, a fact which Penrose wanted to avoid addressing as much as possible. An earlier report, the Archer Inquiry (named after Lord Archer of Sandwell who chaired the investigation) was held in London. This was a very low budget privately funded inquiry and the Westminster Government did all it could to avoid implementing key recommendations which were largely based on my own research recommendations. Evidence on blood contamination often crossed borders and should have been valid in both inquiries. I had hoped to give evidence to the Penrose Inquiry but became swiftly disillusioned when told no evidence that showed government, NHS liability would be accepted. So I decided it was a waste of time and energy to participate in something designed NOT to have a positive outcome and penned my reasons for doing so in an open letter. Although I have evidence pertaining to UK government negligence and human rights abuses spanning several governments which led to over 2,000 deaths and rising and many others still suffering I will not produce this evidence in a UK public inquiry, the Penrose Inquiry. The public inquiry is the foremost vehicle for allaying serious public concern and restoring trust in the state. The Inquiries Act 2005 ensures that the public inquiry will remain a “pivotal part of public life in Britain” and a major instrument of accountability and reconciliation. WHY I TOOK TAKEN THE DECISION NOT TO PARTICIPATE? I cannot morally be part of a system that continually hides human rights abuses in the UK whilst attacking the human rights abuses of other countries…that is total hypocrisy! The Public Inquiries Act does not allow for negligence to be found or for anyone to be held to account therefore it is largely a useless process for those who are wronged obtaining any justice or closure for their suffering. The Public Inquiries Act pre-determines that no negligence will be found as we cannot submit evidence of negligence. A public inquiry is allegedly “the foremost vehicle for allaying serious public concern and restoring trust in the state”… yet I have been informed that any documents that pertains to alleged negligence cannot be shown/discussed…the attitude is “we are not interested in finding negligence”. If this is our “foremost vehicle” then there is something wrong with the state and the system! For many years I campaigned for a “full and open public inquiry” until I realized the system does not work. It was all to no avail anyway, as the Westminster government have always denied a public inquiry into the “worst medical treatment disaster in the history of the National Health Service”. This was prioritising profit over safetyby importing blood from the US multi-national pharmaceutical companies such as Bayer, Baxter, Alpha and Amour (some have changed names). The process of collecting blood bought from prisoners in places like Arkansas State Penitentiary violated almost every safety rule in the book and then it was injected into NHS patients, haemophiliacs with a blood clotting disorder. Infecting them with HIV and hepatitis viruses. 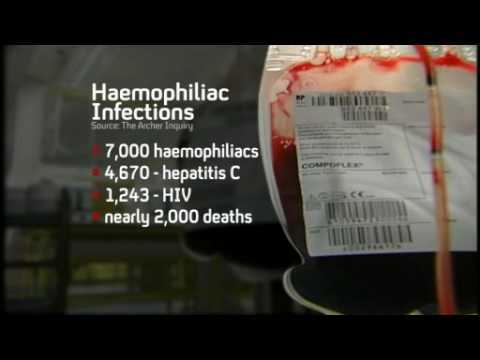 Minutes in the UK between haematologists show a discussion where it is decided to use children for experimentation with dirty blood to follow disease progression as they are “cheaper than chimpanzees.” Then test results for HIV and hepatitis C were carried out without permission using blood samples given only for blood clotting levels. Positive test results were withheld for years to make it harder to litigate due to legal time limitations after finding out infection. Many have since died and their families are left suffering from physical and mental health problems following years of caring for their loved ones. In this section, I have listed some of the alleged safety violations below (this is just one prison, there were several used for plasma collection) as detailed by the sister of a prison plasma donor whose brother a known drug addict died of hepatitis C induced liver failure. She was horrified that her sick and dying brother was allowed to sell his plasma and wanted this exposed. We were in regular contact and I submitted a letter covering the horrors which was handed in to then Prime Minister Tony Blair at No 10 Downing Street. Later at a meeting in Westminster attended by Members of Parliament including Paul Goggins, we asked former Health Minister Yvette Cooper to investigate the use of Arkansas Prison blood as I knew her own past links to Arkansas which might have been helpful. She agreed to do so in front of MPs and campaigners if we could provide plasma treatment batch numbers traced directly to the prison which we did…. With the help of lawyers, we even traced which treatment batches had included infected donors (HIV, hepatitis) from the prison. Then despite doing exactly as we were asked and writing to Yvette Cooper, we were totally ignored! Even when available, tests for HIV and hepatitis were seldom utilised, and when they were, results were often falsified. Needles were sharpened with sand paper and collection tubing was re-used from inmate to inmate, thereby cross- infecting virtually the entire donor base. The collected plasma was stored in a freezer that was often out of order. Plasma rendered unfit by thawing was refrozen and shipped out in regular shipments. Plasma that was rejected by the plasma brokers as unfit was returned to the Cummins Unit for destruction. Out of each returned case of plasma, one of two units were destroyed and the rest was refrozen and re-shipped. During periods of time when the US food and Drug Administration had shut down the Cummins Unit Programme due to their unsafe practices, the Arkansas Department of Corrections administrators continued to collect and sell plasma, using names collected from the local telephone book and selling it through a community plasma center. These safety violations meant that prisoners were cross infected with blood borne viruses and thousands of haemophilia patients around the world died due to this imported treatment. The UK government were repeatedly warned in writing of the risks…but ignored the warnings. The callous, unethical and unlawful acts of both the UK and US with regard to bad blood through flawed and extremely dangerous government policies, the fact that whistleblowers and victims were suppressed and continually abused has led to my losing all faith in my government and so called “western democracy”. However the appalling way, myself and others were treated has helped me understand the process of radicalization incited by unethical government policy when rules are broken and families are annihilated which is my current area of research. I no longer accept the system of western democracy as every major institution failed haemophiliacs who were left to die unsupported and often in agony as a result of the extreme acts of “biological terrorism”. This was akin to the experimentation at Auschwitz concentration camp which I visited to compare experimentation on concentration camp inmates with haemophiliacs …..very similar, Dr Mengele replaced by other doctors, at prisons in the US and the “NHS Nazis”. Neither Amnesty International nor Human Rights Watch helped struggling survivors when they battled to expose the truth. Amnesty told me that “there were no human rights abuses in the UK” they focused abroad. Even haemophiliacs’ own lawyers were found to be corrupt with one struck off for misappropriation of funds and behaviour not befitting a solicitor. Then a government trust fund set up to help victims was embezzled by a government employee who faked around 20 false profiles of sick and dying haemophiliacs to claim money from a trust. I no longer have faith in my government or these institutions within British and US society. I have decided to withhold my vote and encourage others to do so as voting in this western democracy and believing it is possible to achieve meaningful progress and change is a complete and utter waste of time. I have now received a reply from the Secretary of State for Health to my letter regarding contaminated blood and recent associated developments. In the reply, the Secretary of State acknowledges that many remain unhappy with the current system of financial support and has stated that the Government is awaiting the publication of the report of the Penrose Inquiry. The reply also notes the work of the All Party Parliamentary Group and recent Backbench debate in informing its eventual response. Unfortunately, in relation to the matter of bereavement payments, the reply states that the changes made to armed forces widows/widowers benefits were for ‘distinct and separate’ reasons and that the Government is not considering extending this to other cases. Please find a copy of this reply attached. I hope you find it informative in clarifying the Government’s current position. Yet another example of the way our community is treated. The widows of those who wage illegal wars, slaughtering innocents in Iraq and Afghanistan are made a special case while those who were peaceful carers to their sick relatives infected at the hands of the state are penalized. That is our British values… tell that to Theresa May! I would like to remind her that the British government has killed more innocent people through biological state terrorism than have ever died at the hands of any other so called “terrorists” in the UK. In fact may I suggest that the government target and drone themselves for their crimes against humanity. They should be the ones observed and monitored day in day out in a Prevent programme as a severe safety risk to society and showing little remorse… such hypocrisy and double standards. 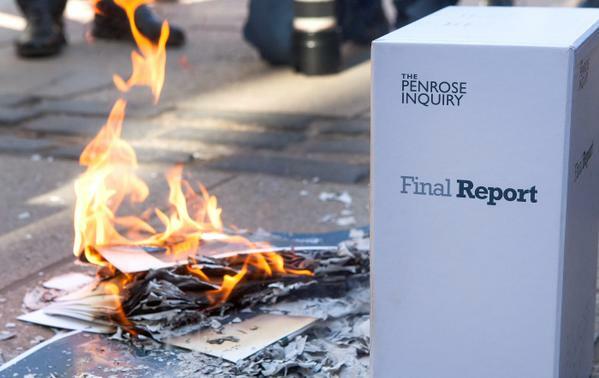 Campaigners were so angry on reading the report they set it alight and called the report a whitewash. What use is PM David Cameron’s apology when an arrogant government will not accept liability for its own actions. At one point I even received a letter from the Department of Health telling me not to write to them with any more questions, I was apparently asking too many. This is a terrible and ongoing injustice spanning 3 decades now and I have no hope of it ever ending!